The sap beetles are a family (Nitidulidae) of beetles. 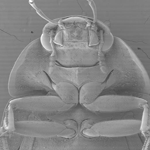 They are small (2–6 mm) ovoid, usually dull-coloured beetles, with knobbed antennae. Some have red or yellow spots or bands. They feed mainly on decaying vegetable matter, over-ripe fruit, and sap. There are a few pest species. 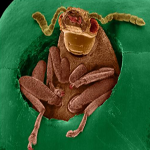 Beetles are insects of the order Coleoptera, which contains more species than any other order in the animal kingdom, constituting about 25% of all known life-forms. They often feed on plants and fungi, break down animal and plant debris, and eat other invertebrates. 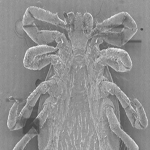 Tick is the common name for the small arachnids in superfamily Ixodoidea that, along with other mites, constitute the Acarina. Ticks are ectoparasites (external parasites), living by hematophagy on the blood of mammals, birds, and occasionally reptiles and amphibians. The housefly , Musca domestica, is the most common of all domestic flies, accounting for about 90% of all flies in human habitations, and indeed one of the most widely distributed insects, found all over the world.